QuestionWhy do we find some robots cute and others creepy? Hopes&Fears answers questions with the help of people who know what they’re talking about. Today, we wonder why humans are drawn to some robots and repulsed by others. Why do we find some robots cute and others creepy? Robots seem to rarely have a neutral affect on their observers; reactions are either "awww" or "ahhhh!" Some robots make us want to name them Buttons and feed them snacks while others give us goosebumps and make us question whether they can smell our fear. The uncanny valley is a theory that says when features look almost, but not exactly, like natural beings, they cause a response of revulsion. The concept was identified by robotics professor Masahiro Mori in 1970, but robots have clearly changed a lot since. We asked several experts in the field of robotics - three robotics researchers and two representatives of robotics manufacturers - to update the uncanny valley theory and explain why us humans have such visceral responses to mechanical beings. You have to consider two separate issues: how it looks still and how it looks in motion. Making things look cute/scary when still is pretty easy to see in dolls. A lot can be done around the eyes, the size of the eyes relative to the face, and the size of the pupils. Where things get interesting, and where I think the uncanny valley comes into play, is when things move. So my view on this is slightly different from the original [uncanny valley theory]. My guess is that the uncanny valley comes from two sources. One is our brain's specialization in processing human faces and human movement. This specialization makes us very sensitive to slight differences. The other is an aversion to disfigurement, possibly as disease avoidance. 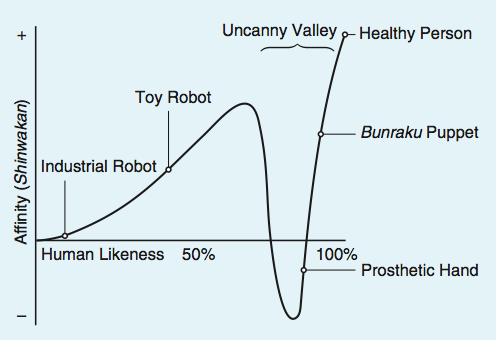 "Valley" in the term 'uncanny valley' refers to a dip in a graph that describes affinity towards robots on the Y axis, and a robot's human likeness on the X axis. The term was coined in an essay written in 1970 by Masahiro Mori, then a robotics professor at the Tokyo Institute of Technology. Certainly, people often find more human-like robots (Androids) to be somewhat creepy when they meet them for the first time. However, this feeling usually goes after a relatively short time. 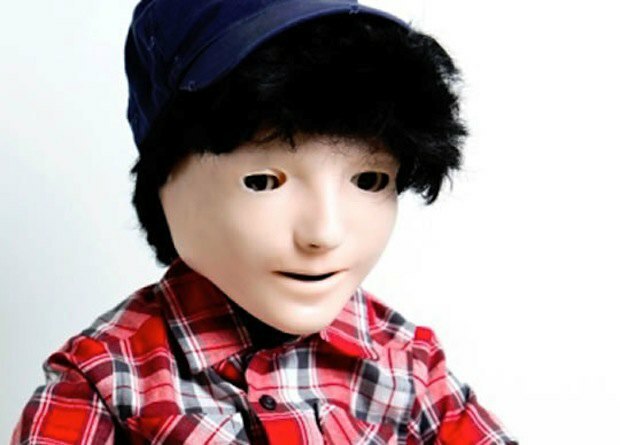 Our own Kaspar robot used for autism therapy, although perfectly acceptable to children with autism, is usually percieved as "creepy" by many people when they first meet it. My own view [on the uncanny valley] is that the "creepy" effect occurs when a robot's appearance and behaviour are inconsistent with each other. This also relates to what people expect from robots. So if a robot looks like a person, but then behaves in a stilted mechanical way, they are disconcerted by this. This would also occur if, for example, your toaster suddenly started moving of its own accord. You would find this just as "creepy." Of course, if we lived in a world where people expected toasters to deliver the toast to the table, then this would not be seen as "creepy" behaviour. Regarding robots that are perceived as cute by people, the robots built by Cynthia Breazeal are great examples of cute robots. Generally, these robots take advantage of people's natural nurturing behaviour towards babies and baby animals. They usually have a number of baby-like features - such as large heads and eyes, furry or brightly coloured (cartoon-like) bodies - and may make baby-like sounds. 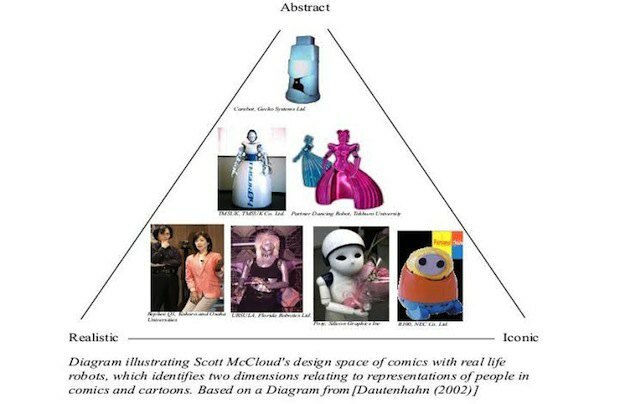 Robot appearances can be manipulated to be percieved as "creepy" if too far towards the Realistic and Abstract points, or "cute" if closer to the Iconic or cartoon-like, point. c. 50 AD Greek mathematician Hero of Alexandria described a robotic machine used to automatically pour wine for party guests. 1206 Scholar and inventor Al-Jazari created hand washing automata. 1921 Czech writer Karel Čapek coined the term "robot" in his play R.U.R (Rossum's Univeral Robots). The word comes from "robota," meaning "labor, drudgery" in Czech and Polish. 1961 The first programmable and digitally operated non-humanoid robot, the Unimate, was installed on the assembly line at Gernal Motors to lift hot pieces of metal from a die casting machine and stack them. 1973 Wabot-1 was built in Tokyo. It could talk, walk, and measure distances and directions using external receptors. 1989 Manny was a full-scale anthropomorphic robot with 42 degrees of freedom and an artificial respiratory system to simulate breathing and sweating. It was developed for the US Army's Dugway Proving Ground in Utah and although it couldn't walk on its own, it could crawl. The features that make robots cute are the same features that make anything cute: neoteny. Neoteny is the retention of features in adults typically found in juveniles. Babies have a big head and large eyes in proportion to their bodies. These features cue our desire to parent. Most people cannot help but feel protective and loving toward babies. Some of these features are found in supermodels. The animated robot WALL-E used its big soulful eyes to great effect. Making a robot scary can be achieved intentionally by going the other direction - focusing on features of strong, mature, and potentially threatening adults, as in The Terminator films, or of dangerous non-human animals, as in the Alien films. However, of greater concern in social robotics is when we try to make a robot look like a normal human being but instead create something uncanny and disturbing. This phenomenon, known as the uncanny valley, occurs when some features appear real, alive, and human and other features appear fake, dead, and nonhuman. It is easy for robots to fall into this trap because they are nonhuman. A movement that looks a little too mechanical or an utterance that sounds a little too synthesized can be creepy. An aversive response is being triggered, perhaps the same response that keeps people from intimate contact with dead or dying bodies. Dead or dying bodies are at once potential sources of infection and of no reproductive value. A robot misidentified as one, if only subconsciously, would be creepy indeed. 1997 Hadaly-2, developed at Waseda University in Japan, was a humanoid robot that could realize interactive communication with humans. It communicated not only informationally, but physically as well. 2000 Honda create its 11th bipedal humanoid robot, ASIMO, which is able to run. 2003 Actroid, developed by Osaka University in Japan, is a robot with realistic silicone "skin." 2005 Nao is a small open source programmable humanoid robot developed by Aldebaran. 2007 TOPIO was a ping pong playing robot developed by TOSY Robotics JSC. 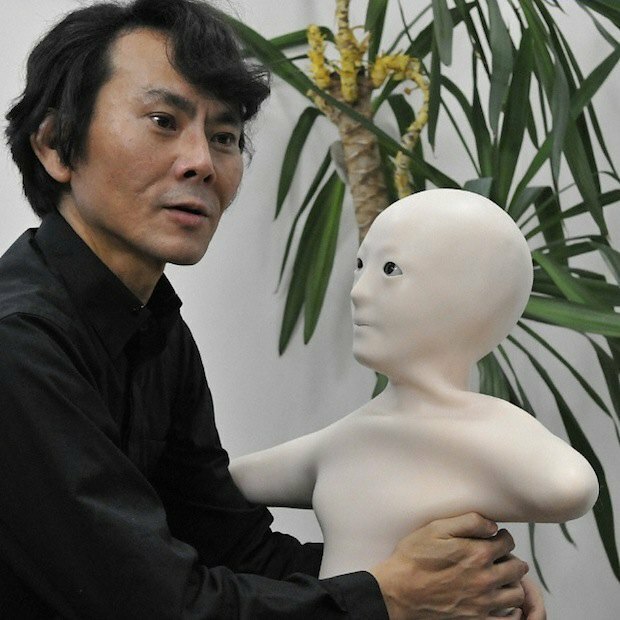 2010 Researchers from Osaka Universits and the Advanced Telecommunications Research Institute to develop a minimalist humanoid robot Telenoid R1 that recreates the physical presence of a remote user. 2010 NASA and General Motors created Robonaut 2, a very advanced humanoid robot intended to do spacewalks for NASA. 2011 Robot Auriga is the first brain controlled robot and was designed in Turkey. It can service food and medicine to paralyzed people by interpreting the patient's thoughts. To some people all robots are scary, even the kindest most gentlest ones. ASIMO was developed for use in the home, specifically for interaction with elderly patients - patients that may have grown up in the era when all robots were evil. We wanted to make ASIMO as non-threatening and friendly as we could while giving it enough size and ability to actually perform useful tasks. There are no sharp corners. Every inch is rounded. The size is four feet three inches so if the robot is standing and you’re sitting, your're still going to be eye-level with that robot. The initial dreams for the design of the robot was based on an old Japanese cartoon character Astro-boy. 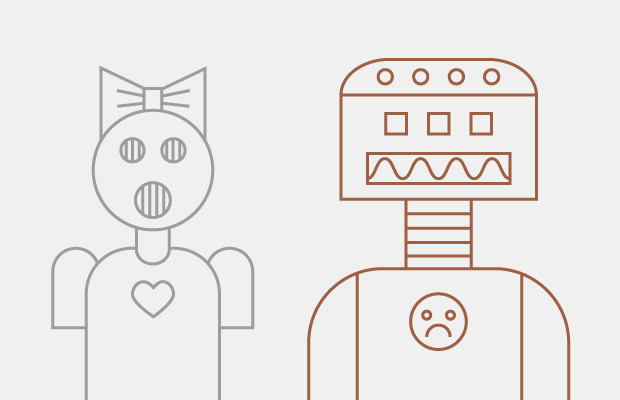 All our robots - NAO, Pepper and Romeo - are designed to look cute and engaging. Our designers and engineers did this on purpose because, as social robots, we want people to be comfortable to come up and interact with them. There is a theory called 'uncanny valley' where the closer a robot looks like a human the creepier it is said to look. At Aldebaran, we want robots to be humanoid in shape (we have found this is the easiest shape to move around and interact in our world which was built for humans) but to also be obviously a robot.